All orders may be subject to authorization. Remittance of any taxes on orders shipped outside of Pennsylvania is the responsibility of the purchaser. Any order changes/additions/cancellations can only be requested through telephone contact with our Customer Service Department no later than 7:00PM ET Mon-Fri. Customer Service can be reached at 1-800-494-9144. I do t see this one showing up. What's the code? P&C seems to be clearing out a lot of stock lately. I need more tobacco like I need... something I don't need. However, this is one of those "I'll Hate Myself If I Don't Take Advantage" sorta deals.... heavy sigh. Thanks a lot Zito, he said in a sarcastic tone. Just ordered as well. This is our first indisputable event showing what's to come. Scary stuff, but great deal. "Sadly, due to some new regulations that are coming, all of the current Hearth and Home Marquee blends will disappear from the market. If you smoke these blends on a regular basis or have wanted to try a few, now is the time. We are providing you the best opportunity to stock up and save over the next 2 months with this Buy 2 Get 1 Free offer. All you need to do is add as many tins as you would like in multiples of 3 and we will do the rest"
Interesting. Technically they could file for deeming with the FDA and keep the stuff going for a couple of years, but they have decided not to bother. I guess it makes more financial sense to close up shop on these small market niche blends. I picked up a few tins as I already have some aging and really don't need more. By the end of the year it could be like the 1970's again, except there will be no house blends at your local B&M, and the pickings for foreign made products will be slim since after December they will have to comply with FDA regs to sell here. But take heart. You'll be able to buy all the Middleton blends that you want because their parent company brought this calamity on. Please show/tell where this paragraph is on the website. I've looked all over...except where it is. They seem to have taken it down. It was there. Nate...I saw that right off. Not the same paragraph. Glad I could help guys. I was off to play golf early this morning so I posted this quickly without adding more specifics. Now all we need is a 20% off sale for the 4th of July and you all will be kicking yourselves for not waiting, a mere 33% off. It is also on the cover of this months catalog. Correct me if I'm wrong zitotczito but you can type in the word marquee in the promo code box an get another 15% off instantly too. Hmm, good question as my P&C Calendar shows the 15% for June only. I do not have the catalog of which you speak, but lets give it a try and I will be back. I just tried the code "Marquee" and the site states that it has expired. Correct me if I'm wrong zitotczito but you can type in the word marquee in the promo code box an get another 15% off instantly too. That was last months special. I tried it at checkout and it came up invalid. You'll be able to buy all the Middleton blends that you want because their parent company brought this calamity on. Good bottom-line assessment, as usual. Seems legit! That was a very cathardic order. Hopefully I don' t get any "Sorry that is backordered" emails. My guess is that since Pipes and Cigars is owned by Cigars International, CI will be selective on what they choose to submit for deeming regulations etc. Which is unfortunate since they have a lot of nice blends that are popular with a lot of pipe smokers. The monthly blends are going away, now the Hearth & Home Marquee series. Very unfortunate. Seems like you get 20% off, on top of the buy-2-get-1 Black House deal. Forgot to add that. Thanks for the heads-up zito. Just ordered 15 tins and yes Summer does get an extra 20% taken off. If something is backordered do they charge you shipping again when they send out the backordered product? Just ordered 6 tins of Magnum Opus as I was out, and ordered 3 more tins of White Knight. You know, it never occurred to me before that I can place an order for something there listed as "Backordered", despite the "add" box being present and active. Just ordered 18 of various Marquee blends. Viprati is the only one I haven't tried yet, the others will all be stored away for the future. I still have a few blends in the old style cans but this deal was too good too pass up with the extra 20% on top. This deal is incomparable to any I've seen so far. Buy 2 get 1 free and then 20% off equals $5.33 per tin. That's right at 47% off the original price. "Summer" still works for many things right now, but not for this deal anymore, happy for anyone who got it. I did not buy any Marquee Series personally, but that was a smokin' deal. I just tried it myself and it's a no go now. I placed an order this morning that worked. I was told it shouldn't have. Seems they fixed their mistake. I placed an order including 6 tins (a tin of each blend except Blackhouse) and some other stuff few hours ago, 20% discount worked. It is not working right now. I was very lucky I guess, but not that much because Viprati is backordered. Thank you very much for the info guys, you are great. They keep tempting me, despite knowing that I am weak... will there be a sale on Royal Yacht? Damn... if my math is accurate... 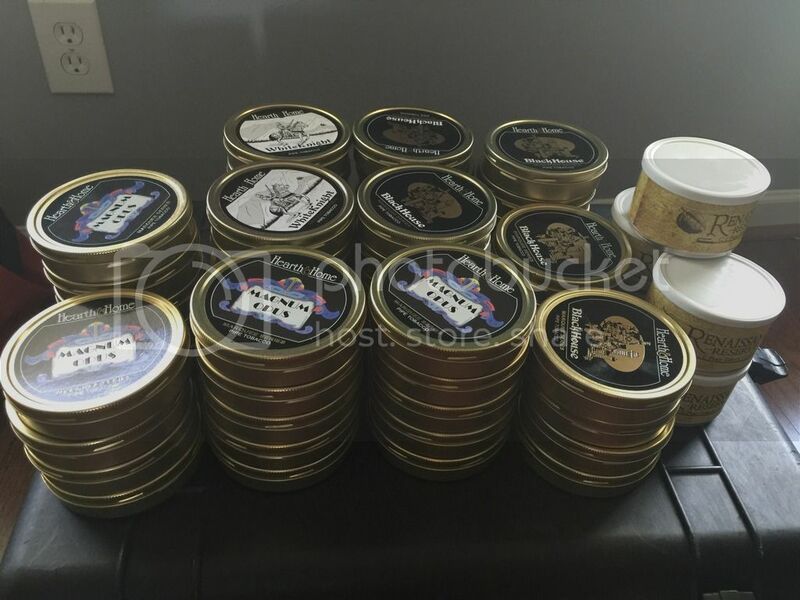 Apparently I ordered a total of 45tins from this sale. That's messed up. What the F are you guys doing, allowing me to buy this much tobacco?!?! You're a bunch of enabling addicts!!! I gotta get outta here and go to a meeting. Our plan is to continue selling the Marquee Series until we're no longer allowed to. The idea behind this sale was to let the fans of H&H Marquee a head start to building up a stockpile rather than scrambling at the end when supplies may be thin. Thanks for that Russ! I'm stocked. Nate, are you on tobacco cellar? I need to keep track so you don't get ahead of me. Zito, I actually just recently started using a brilliant iOS app for inventory. I still haven't completed inputting everything. Yours on that site? Interesting and mine is on tobacco cellar under my handle. I do not have a cell to use that app so I have to stay where I am. Damn Zito! That's a serious stockpile of tobacco!!! Party at your place when the society collapses?! You've got FAR more than I do! Our plan is to continue selling the Marquee Series until we're no longer allowed to. But how long will that be? I find it interesting that they extended the Marquee sale into July when it was supposed to end on June 30th. I have bought 5.4lbs of tobacco in the last 48hrs. My cellar is 42lbs now. But how long will that be? Approximately 20 months according to another statement Russ made, in another place far, far away. Is this something I should hit, if I have never tried H&H blends, and if so what would you recommend, additionally thanks for the heads up. You will get many answers. They make a lot of great stuff. I love "Chestnut", "Chatham Manor", "Magnum Opus" etc. The Midtown tub tobaccos are excellent and at such a good price. Chestnut, yes. Yes, take advantage. 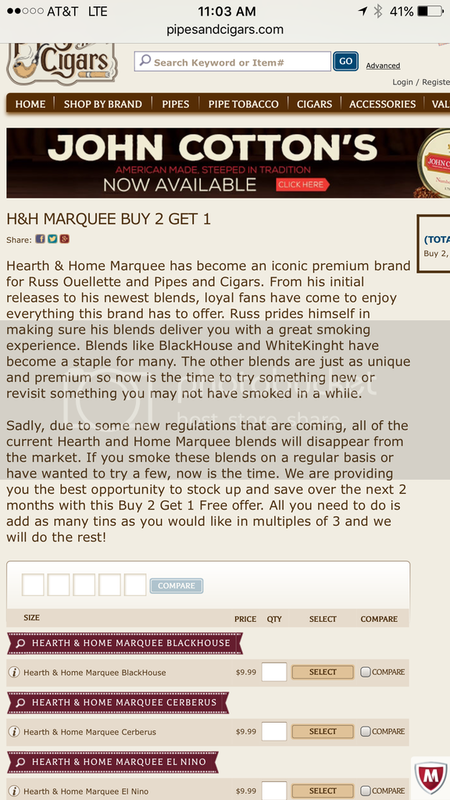 H&H makes some of the most popular blends available. What to get depends on what you like. Like English or Balkan? Magnum Opus and/or WhiteKnight are just two of many great English blends. Va/Per - Viprati, Anniversary Kake. Latakia hound? Larry's Blend, Etc, Etc. How well do these blends age? I like the fact that they come in round tins. Those types of tins age really well so why not order a hundred or 2 tins for the cellar. Look at the ingredients and make your choices. My guess is that Viprati will age rather nicely. WhiteKnight is the blend closest to the flavor profile of the Balkan Sobranie of the past and that includes the Germain's version, which is less true to the Sobranie or Russell versions. Latakia loses it's punch, but by the time this batch does, I'll be oily dust scattered by a river. jesse, I agree about anything that includes Latakia in it as we all know it starts to lose it's flavors after 10 years or so. I agree about anything that includes Latakia in it as we all know it starts to lose it's flavors after 10 years or so. How the heck is Vintage Syrian a thing, then? Isn't that decades-old stock? Frowny-face? Impossible! I'm still smiling about that p&c double-dip special, and I don't even smoke any of the Marquee! It was a seriously great deal but I think over did it. It's a disease!!!! A disease I say!! I spent my budget for the month already, else I would have grabbed some. If by this time next month you still feel as if you overdid it, PM me and I'll ease your troubled mind. Stocked up on Magnum Opus. Thanks for the tip! Thanks Tom! I'll keep that in mind!